Buy First Quality Cutie Pants Boy 2T 3T White - 26 Pants online! You are buying the First Quality Cutie Pants Boy 2T-3T White Up to 34lbs CR7007 26/bag - Model #CR7007 from First Quality. First Quality is a leading manufacturer of incontinence products including briefs, liners, underwear, diapers, and underpads. At ADW Diabetes, we do our best to offer the complete product line by First Quatliy with discounted pricing up to 60% off retail. 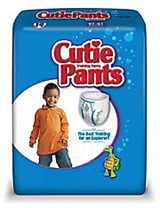 First Quality Cutie Pants Boy 2T-3T White Up to 34lbs CR7007 26/bag are both a great quality and value. The refastenable sides make for quick and easy checks and changes. Customized protection for boys and girls helps prevent leaks and characters fade when wet to support potty training. Training Pants designed to meet the needs of children with the value and features moms love. Designed with Dri-Guard for leakage protection and available in a variety of options including refastenable sides, standard underwear style, and overnight protection. Designed for Boys - Designed specifically for a boy. Designed for Girls - Designed specifically for a girls. Vitamin E and Aloe - Promotes skin wellness and reduces dry irritated skin.